Airport operations include very complex complicated activities. And, those activities must be coordinated and accomplished by a variety of organizations and individuals. Pilots, air traffic controllers, maintenance crews, emergency teams, and airline operations staff must work collaboratively to sustain safe and efficient flight operations at their airport. 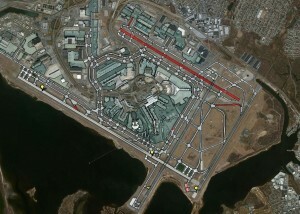 And, most importantly, they all must have reliable and up-to-date knowledge of the airport blueprint. Though pilots typically navigate the airport surface based on their visual aids, they also rely on paper or digital charts of the airport as Air Traffic Control communicates the route the pilot is to follow both in the air and on the ground. To maintain safe distances between aircraft traffic, surveillance of the airport surface is typically based on visual clues by both the ATC team and the flight crew based on “see and avoid” principles, aided by radio communication. And, to complicate the support of flight operations at the airport, consider that the duties performed to keep things running smoothly and calamity-free are performed by separate organizations – and they too would need the identical accurate geospatial information about the surface features that ATC and pilots need. It is easy to see from these basic operations that ATC, ground crews, and flight crews would all benefit from shared accurate geospatial information related to the airport layout and location of runways, taxiways, and other ground-based features. In addition, Fixed Based Operators (FBOs) support General and Business Aviation operation tasks including maintenance, fuel, flight planning, and local ground transportation services. Airworthiness and civil aviation authorities and the aviation industry are working to provide guidance to Airport Mapping Database providers, such as AeroNavData, to standardize the collection and attribution of airport feature data. Data consistently captured and maintained to these standards (RTCA DO-272/ED-99) would enable all users and recipients to utilize the data for a myriad of applications, capabilities, and purposes resulting in greatly improved and enhanced airport operations. We fully understand aeronautical industry’s business processes and data standards and that allows us to develop, analyze, and manage database systems that serve the unique requirements of aviators and of those agencies that are responsible for management of shared aeronautical procedure data. AeroNavData has the capability to collect airport feature data to the strict guidelines as outlined in the RTCA DO-272 / ED-99 standards. We are experienced in the design, implementation, database development and management, and data analysis that eliminates inconsistency and enthusiastic adherence to data standards. Email Leah with questions or for more information.